This is a fun math activity that I have used for several years in grades 6-9. 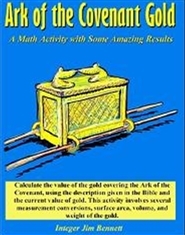 It references the description from the Bible to calculate the amount of gold used to cover the Ark of the Covenant. Once the students determine the amount of gold used, they can calculate the value of the gold using the current price. The students discover that the value of the gold exceeds a staggering ten million dollars! The math concepts used in this activity are measurement conversions, the calculations of surface area (drawing a net), calculating volume, and weight (in customary and metric units), and percent. There is a paper model included that the students can color, cut out, and assemble. 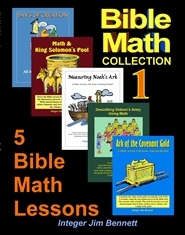 This is a cost-saving collection of 5 of my most popular Bible Math lesson plans. 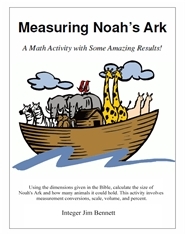 They are appropriate for middle grades and higher and include math lessons about Creation, Noah’s Ark, Ark of the Covenant, King Solomon’s Pool, and Gideon’s Army. These lessons may be purchased individually. This collection contains every page in the lesson booklets. My students loved these projects. They are excellent for schools and homeschools - middle school through high school. These lessons were created by an award-winning middle school math teacher and are some of students' favorites. 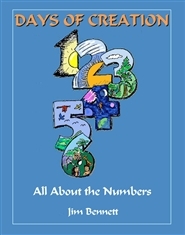 This is a complete math lesson using the account from the Bible to practice comparing numbers using ratios, percents, bar graphs, and pictographs. Appropriate for middle grades and higher. It enables students to understand more clearly the great miracle that God performed in enabling Gideon's very small army to defeat the much larger army of the enemy. The lesson provides a master for a worksheet and a detailed answer sheet for the teacher. It also includes images that may be used in creating a pictograph. This lesson was created by an award-winning middle school math teacher. 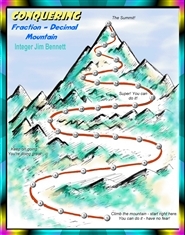 Fraction Practice is part of a complete instructional program that was created by Jim Bennett, an award-winning educator. 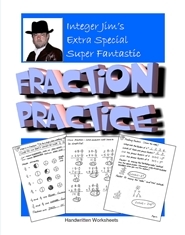 Use the special handwritten work sheets in this booklet to practice working with fractions and mixed numbers. Simplifying (reducing), adding, subtracting, multiplying, and dividing are all covered. Answers are included in the back. 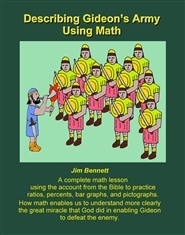 Free video lessons that explain these practice sheets can be accessed at mathhelpwizard.com and learnfractions.org. 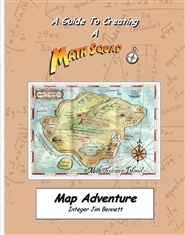 The author's website, mathsquad.com, offers more ideas for creative ways to teach math. 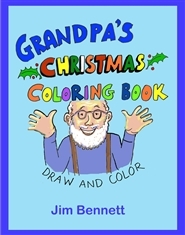 A 20-page coloring book with a Christmas theme. The subjects of the pictures are: an angel, candle, Christmas Tree (you decorate it), bells with holly, a present, reindeer, candy cane, banner, fireplace, wreath, open Bible, praying hands, star, "For unto you is born..." scripture, nativity scene (you add the animals and visitors), and joy to the world. Some pages need to be finished. Some need to be decorated. All the pages need to be colored. Use your imagination and be creative! 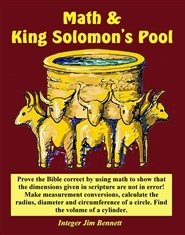 This project shows students how to prove the Bible correct by using math to show that the dimensions given in scriptures are not in error, as some critics have asserted! Appropriate for middle grades and higher. Practice making measurement conversions, calculate the radius, diameter and circumference of a circle. Find the volume of a cylinder. Includes a lesson on the history and design of the pool, a math worksheet, a teacher answer key, and a paper model that students can build. This lesson was created by an award-winning middle school math teacher.